Teletalk 1425 MB 1425 Talk-Time & 31 SMS on 31 Tk Recharge Boishakhi Offer 2018. Teletalk brings and an amazing offer to celebrate the Boishakhi Utshob 2018, Where all the Teletalk customers can enjoy 1425 MB 1425 Talk-Time & 31 SMS at only 31 Tk Recharge. Applicable for all Prepaid Customers. To activate the offer Recharge 31 Taka or dial * 111 * 31 #. 1425 seconds talk time, 31 SMS can be used for any operator. The offer will end April 16th. The offer price includes VAT, SD and surcharges. 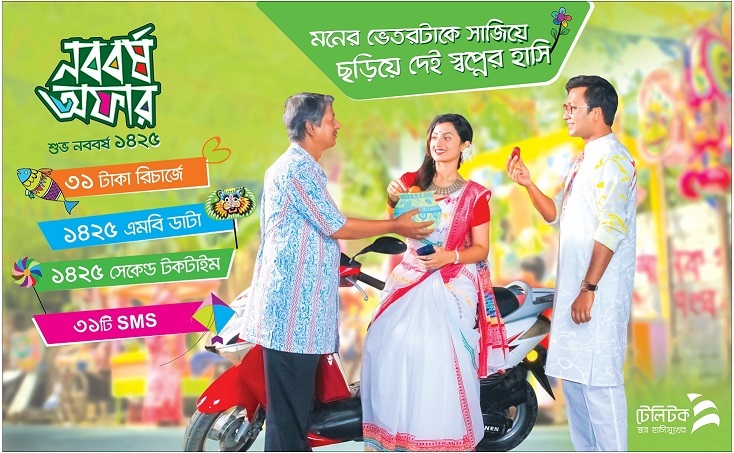 If you have any questions about Teletalk 1425 MB 1425 Talk-Time & 31 SMS on 31 Tk Recharge Boishakhi Offer, then comment we will replay you back soon.